Please indicate your name inside the e-mail body. Mr. Rogers will use this for communicating information during the year. Click here for abbreviated syllabus on the official school letterhead. Tutors IB Computer Science students (a 2nd year course) are required to act as tutors. Check with individual students or Mr. R for availability. Why is computer science significant? AP Computer Science is a a college level course that teaches students how to progam in the Java language, analogus to writing and publishing in the previous era of the printing press. The course cannot create the equivalent of novalists but is an importat step toward mastering computer science. At the course's end, students will be required to take the AP Computer Science A test. If they pass they may receive college credit for one semester of computer science. At Southside, you will typically take AP Computer Science before your senior year. Hence, your AP score can also be a significant factor in scholarships and college entrance. For more information contact the American College Board. By any measure Java is one of the top computer language in the world. A person knowledgeable in java can generally pick up other top rated languages such as C or C++ without too much difficulty. Computer science and the related area information technology (IT) form the single largest job market with one of the highest pay rates of the science, technology, engineering, and math (STEM) disciplines While a student may never work as a computer professional, he or she is very likely to work with one. Previous exposure to Java would be helpul.. In college, computer science is generally considered an intellectually challenging course. Correlations between the combined PSAT math and verbal scores with the passing rate in AP Computer Science bears this out. However, AP Computer Sciencehas an advantage over the equivalent college course in that it takes an entire year to present what would be considered a semester of material in college. Topic Outline: This link give the official AP computer science topic outline. Java Subset: The Java language is huge and so AP computer science will focus on a limited but very powerful part of the subset. Case Study: A case study is included in the requirements. Students will use it to learn how to read and modify the code in a major software application. Computer Lab: Our computer lab contains up-to-date computers as well as a promethean board for displaying information to the entire class. All classes (5 days a week) will be held in the lab. Computer Lab Hours: The lab or computers in room 134 will normally be open for an hour after school every day except Wednesday. Objectives Provided by Mr. Rogers: The daily objectives used in class along with programming and homework assignments are all available online. Textbook Page: this page has lots of Java information including student files which you will want to download. Java Subset: AP Computer Science uses a limited subset of the Java language. At the beginning of the year the subset will have little meaning, however, students should review it in detail when making final preparations for the AP Exam. Solutions to the AP Free response problems. Google: googling just about any Java topic will bring up tutorials or other useful information. Java is a great language for online resources. A USB thumb drive for backing up programs. Note: you are responsible to keep a backup copy of your program. Do not assume it will remain on the hard drive of your computer. 3 x 5 Cards. These are for making flash cards with vocabulary terms, code snippets and other useful information to use in studying for tests and the AP exam. Students are not required to have a computer with an internet connection at home however, it is recommended. There are many computer science resources available on the internet. Students can download a freeware version of BlueJ (here) to use at home. This is the same software used for programming in class. 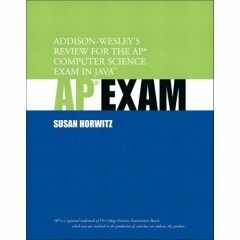 All students should purchase the Barron's Ap Computer Science Study Guide* - How to Prepare for the AP Computer Science Exam by Roselyn Teukolsky. Sources of Help: Student tutors will typically be available at lunch time and at selected times after school. Grading: (For details see Mr. Rogers' Syllabus - Information Common to All Classes.) Tests will be the single largest item and be written as close to AP exam standards as possible. All tests will be pencil and paper just like the AP Test. Course work will generally be finished in the third quarter leaving the rest of the year for review and completion of the major project (see below). The first semester exam will be taken from AP test type materials. The exam grade will give you an indication of your standing on the future AP exam in enough time to take corrective action if needed. The fourth quarter grade will consist primarily of practice AP test grades and the major project. Generally, there is a high correlation between the practice exams and your grade on the AP test. It will be nearly impossible to get an "A" in the 4th quarter and not pass the AP Test. Regular Programming Assignments: every new unit will have moderate sized programming assignments which are due before the unit test. These assignments are listed in the on-line syllabus. Time will be allotted in class to work on these programs but it will normally also require at least some work outside of class. Homework Assignments: these are listed in the on-line syllabus and are to be written out and stapled to the back of the unit test when it is turned in. No late homework will be accepted. Class Work: We will frequently have brief programming assignments in class to illustrate a specific objective. These will normally be due no later than the next class session. Personal Software Project: starting in with milestones in December and ending in May, each student will be required to design and create a Personal Software Project which answers a research question or meets a defined purpose such as a game or educational program. Click here for a detailed description of the project. Be aware that the project will seriously impact both the 3rd and 4th quarters. It will be nearly impossible to get an "A" for the year without completing the project. The Exam will be given on Tuesday, May 6, 2014 at 8:00 am. You must arrive 30 minutes early. The exam lasts 3 hours and Consists of two parts: 1 hr. 15 min. for 40 multiple choice questions and 1 hr. 45 min. for four free response. The test is entirely pencil and paper. In other words, no computers are available. AP tests are graded on a scale of 1 to 5 with 3 considered passing. The test is difficult but is doable if you have learned how to program. 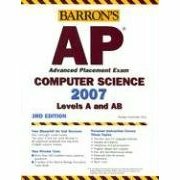 To prepare for the test Students should begin working practice tests in an AP test study book such as Barron's Ap Computer Science Study Guide** no later than December. However, there's no substitute for knowing how to program. Summer Assignments for New Students: Mr. Rogers typically holds one or more orientation 3-hour-long sessions in the summer in order to get AP Computer Science students up to speed quickly. Click here for information and lesson plans. Who Should Take this Class: Traditionally, students with an interest careers related to: business, engineering, computer science, information technology, bioinformatics, genetics, physics, chemistry, or math should take AP Computer Science. However, in today's world, almost every occupation or endeavor uses some form of computer software including the fine arts. Some knowledge about how software is designed, created and maintained will provide useful background. For many college majors, AP Computer Science will be the only college course on the subject a student will take. Credit: Meets the 1 year of computer science requirement for graduation. Prerequisites: Honors Algebra II and and programming experience or permission of the instructor permission of the instructor. NOTE: This is a College level class NOT a beginner's or an applications class (such as word processors, spread sheets, etc.) Students in this class should be familiar with basic computer terms and have some programming experience before they start. A strong math background with a PSAT math score of 58 or higher is a positive indication of readiness for the class. * The comparison of the printing press to the computer is based on input from Dr. Brian Dean of Clemson University. ** Note: Mr. Rogers does receive a small commission from books ordered using the links on this page. This helps cover the personal funds he spends on his classes. BlueJ: This is the software (IDE) we will use for writing programs..
Java API (Applied Programming Interface): Tells how all the libraries in Java are organized and tells how to use them. This is invaluable information that any Java programmer will depend on. Download SDK from Sun: the SDK (Software Development KIt) has the Java compiler you will need for writing programs at home. You must download this before you can use an IDE. Class Central: An awsome site that lists free university courses in numerous courses including computer science. Policy on the Grading of Programs: Mr. Rogers encourages students to look at each other's code and consult with each other on programming problems. Students are encouraged to use the 10 minute rule. If stuck for more than 10 minutes, seek help. However, copying another's program and turning it in for credit is strictly prohibited. Programs will be typically be graded in class. Mr. Rogers will ask questions about the programs at random. Inability to answer these questions will result in a loss of credit. Students will also be asked to reproduce and modify parts of class programming assignments on tests.